Here we go again! Another stacked UFC card. 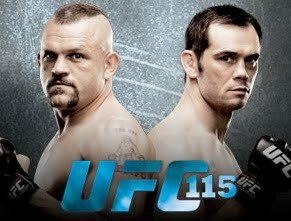 Headlined by the return of the Iceman, Chuck Liddell, after a full year layoff to rest, recover and let his body fully heal after a series of knockouts. There are some really good matches tonight and I'm jacked to enjoy the fights. My predictions for the fights are below. I have entered the same predictions at UFC's Fantasy Game. Get your picks and see if you can beat me! Reason: This is very tough fight to call. Both fighters are on the down slope of their careers (but don't tell them that), Chuck's taken the last year off to let his body heal up and to get in quite impressively ripped shape. Rich is a pro, an extremely well-rounded and talented striker. Like many fights, this one is going to come down to who lands the big punch first. I'm going with the Iceman but it could just as easily be Ace. Check back and laugh at me if I do really bad! You can also post your picks in the comments too. Update: Went 6 for 11 on the night after a truly stellar 5-0 start. Oh well, could be worse, I could have gotten my lights turned off and my lip split like Chuck (we still love you, Iceman!). My calls were good 102 out of 15000+ on UFC's Fantasy Pick'Em.